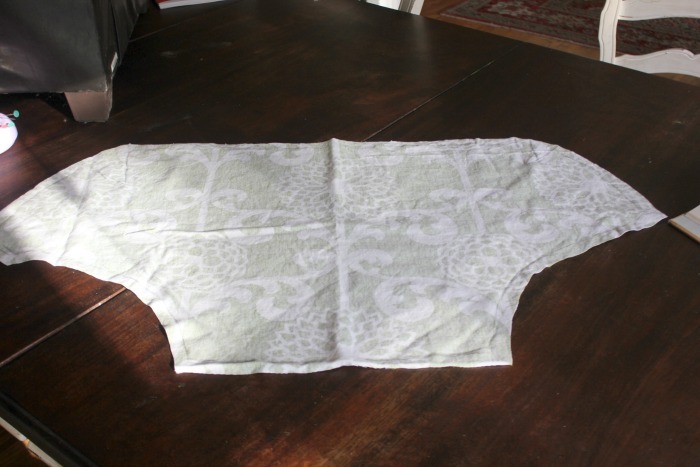 Recently JoAnn fabrics sent me two yards of of this beautiful green and white bold print cotton by Waverly. It’s from their Modern Essentials Line and it’s called Fun Flore. Having a mom who was a drapery designer for 25 years, I am well aware of Waverly Fabrics and I like how they stay on top of trends, yet somehow also remain classic. 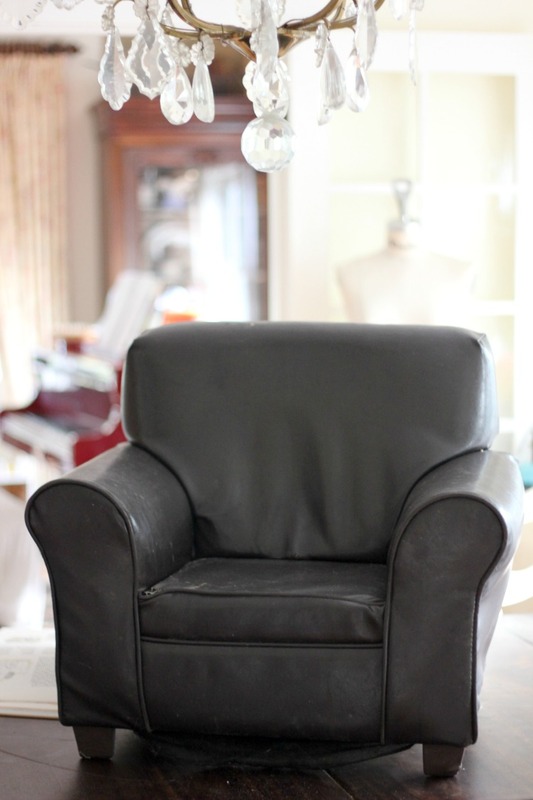 This poor little brown vinyl chair was a thrift shop find. I bought it over two years ago thinking I would make a slipcover for it but never got around to it. I would look at this sad little worn out chair sitting in my den and feel guilty because it was such an eyesore. I had been ignoring the poor little thing for too long. I actually tried to get rid of it once. But my 3 year old daughter found it in my “giveaway ” shed and made me bring it back. 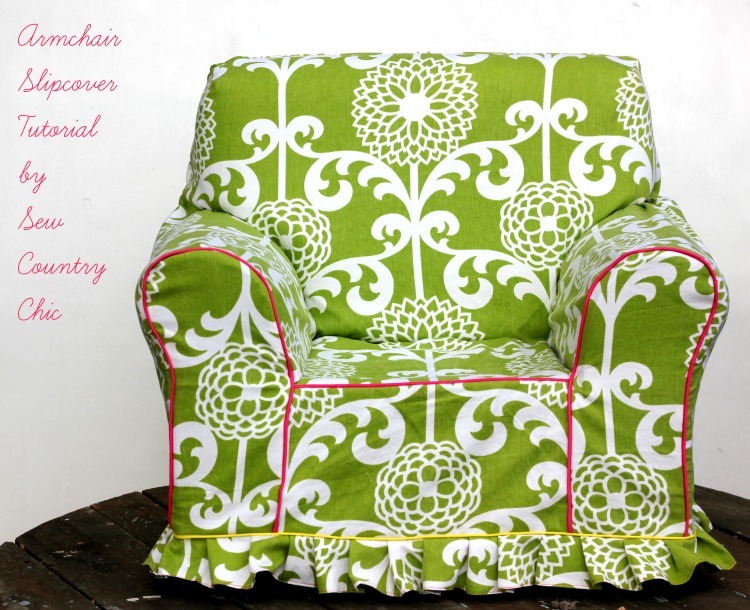 I’m glad she did, because her little chair was perfect to makeover with the Waverly fabric. Sometimes I can be a little relentless with getting rid of things. Especially after watching Hoarders! 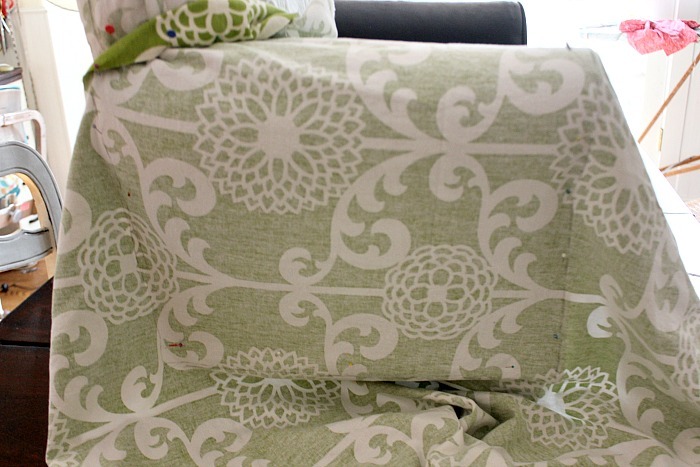 So now I am going to attempt to walk you through the steps I take when I make a slipcover. I’m not really the exact measuring type. I’m sort of an ADD Scattered type, and precise measurements aren’t really my thing. But I can do it if I have to. 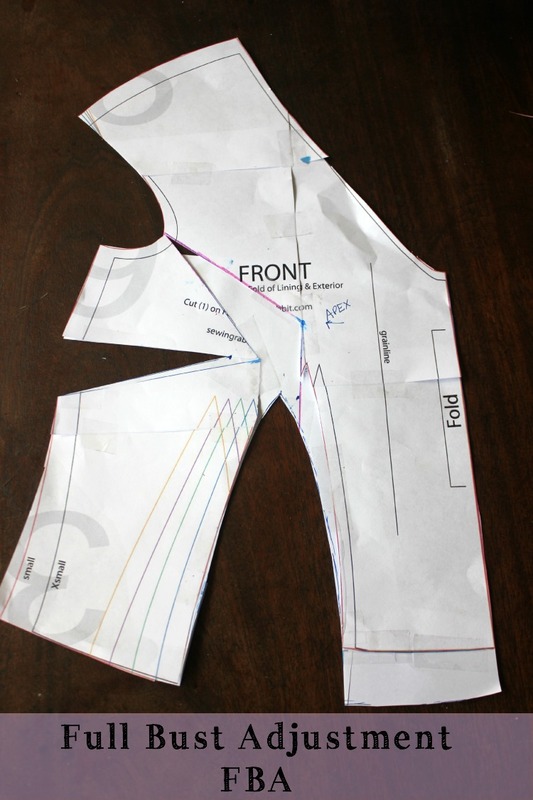 For instance, I have been sizing some patterns and you need to be very precise there. 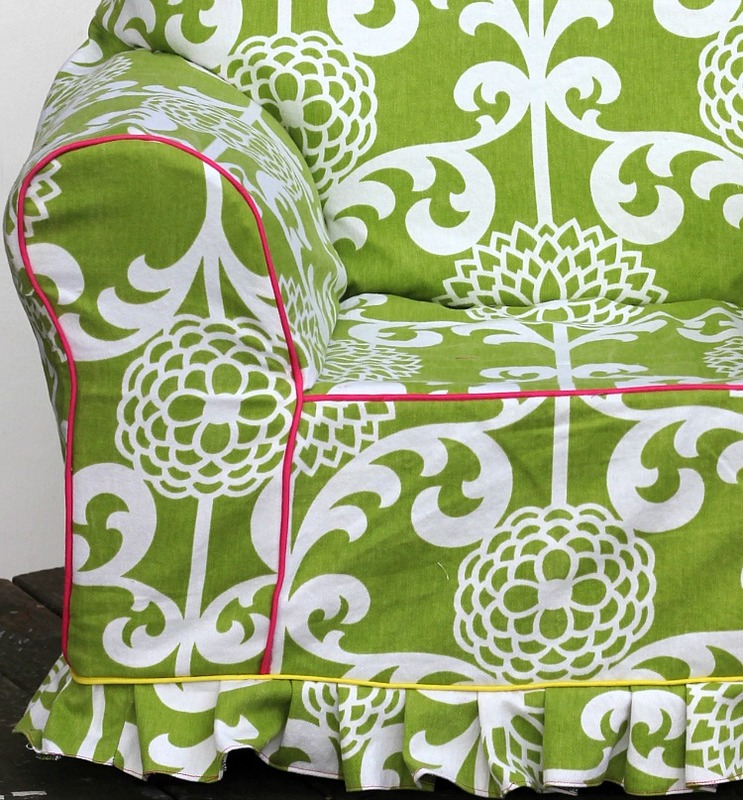 I like slipcovers because I get to drape and draping is my preferred design method, NOT flat pattern making. That’s probably why I have three dress forms. I equate draping with sculpture and art and flat pattern making with…well, math. 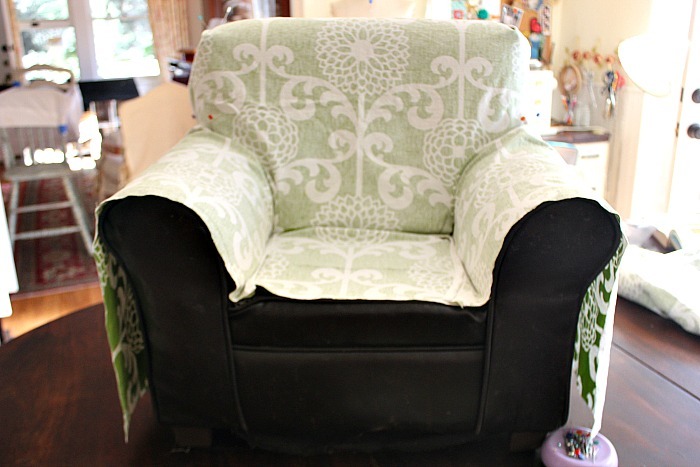 I draped a large piece of fabric to the back of my child’s chair. This chair used up two yards of fabric. The first piece to drape was this backrest above. I made sure my fabric was ON GRAIN and that I liked the pattern placement before I started pinning. I pinned from the top first, then started tucking in the bottom and corners. I had some extra fabric bunching up in the top corners so I draped in a dart. I pinned the dart closed. Once the dart was pinned closed I marked it by tracing it with my pencil. So then when I later took off the slipcover piece, I could see where I would need to sew the dart along the dart fold lines. Then I traced around all of the edges of my back piece with a pencil. This is how I made all of the pieces for my armchair slipcover. Draping, pinning, and tracing. Except for the square shaped part you sit on. Because that was a square and easy to measure. I removed my fabric, unpinned my dart and traced the sewing lines on it with my ruler to straighten out my dart sewing lines up in the top corners up there. It’s sort of hard to see my dart lines in this photo. Sorry! I then cut about 1/2 an inch all around the pencil tracing lines, adding my seam allowance. Next, I measured the square shaped seat bottom. I cut out that pattern easy enough since it didn’t require and draping. 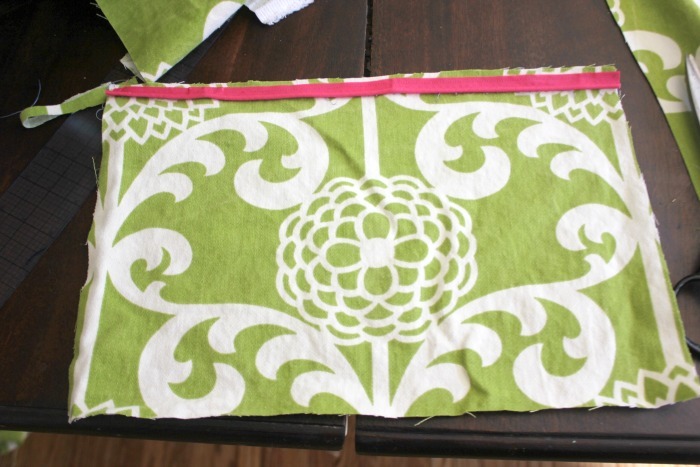 I sewed a piece of fuchsia piping to the seat bottom for a little pop of color. This is a kids chair and needs to be fun! Next, it was time to drape my arm rest pieces. 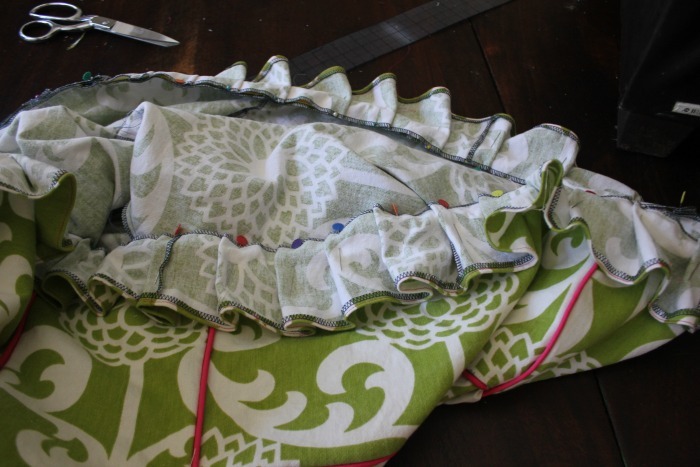 I started pinning from the bottom edges then wrapped the fabric up and around, making sure my fabric was still on grain. Hmmm…can you see how my piece went off grain a little? I had to straighten that piece out. So now I had four pieces cut out and ready to sew. 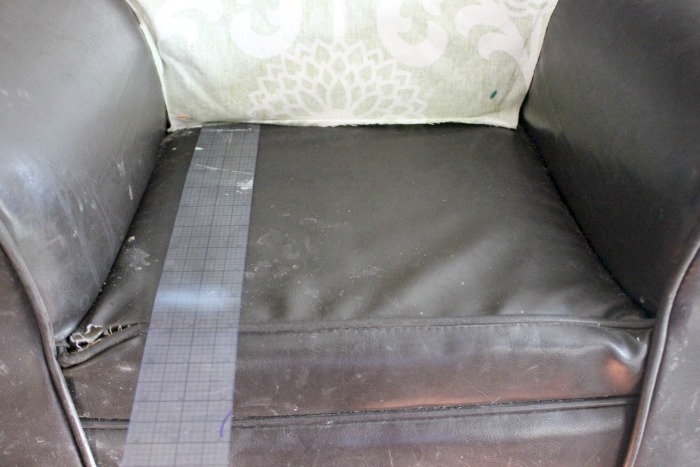 First, I sewed the bottom back rest edge to the top of my square shaped seat bottom piece. 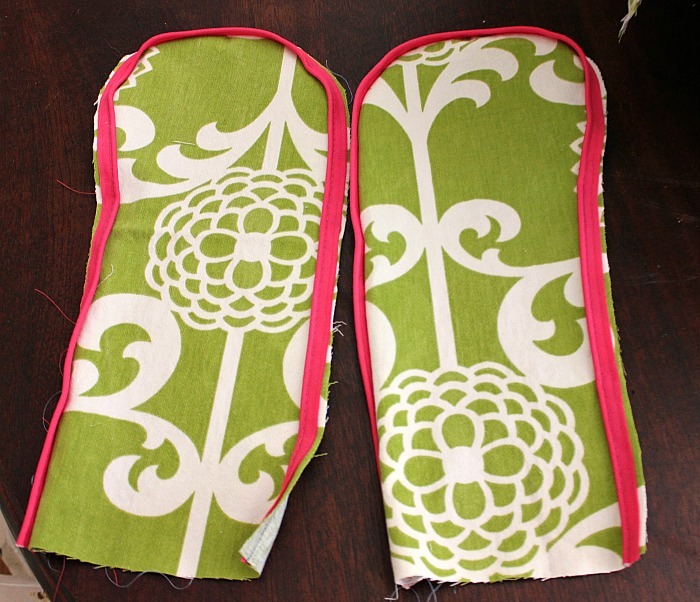 Then I sewed those two bottom curvy corners of the the back rest to the the bottom curvy corners of the arm rest pieces. They were about an inch off, those two pieces, because I had draped them, so I just pinned the ease out. 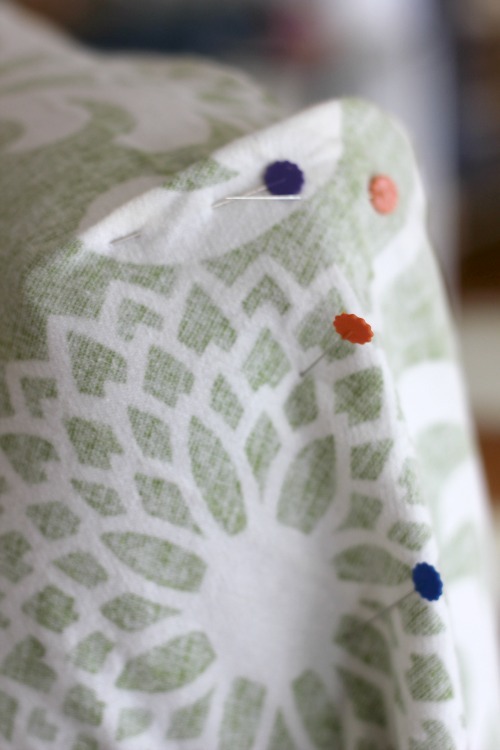 If you need this project to be totally perfect you could always lay your draped fabric pieces down on paper, trace them to make pattern, and adjust all the seam lines so they match perfectly. If I was making more than one of these chairs or selling it, I would. 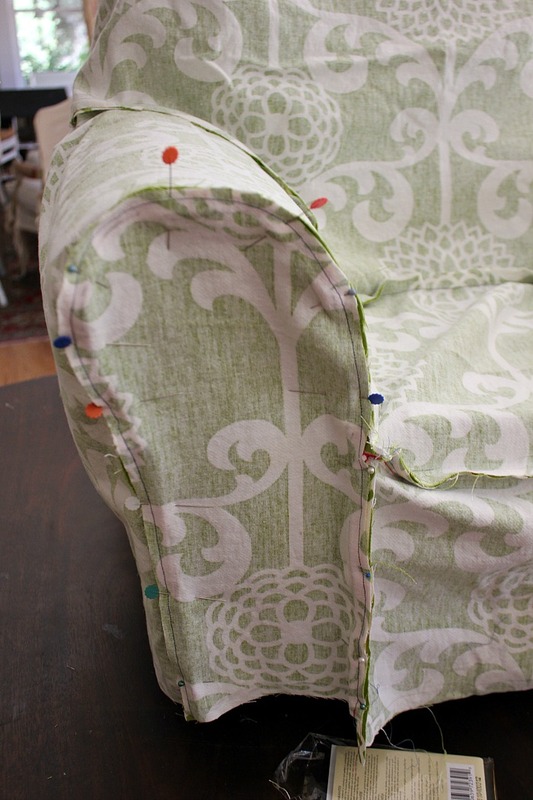 Next I draped the bottom piece that goes from the seat bottom to the bottom of the chair. I sewed that to the piped edge of seat bottom. The next step is to drape those little pieces above. I’m not sure what these pieces are called so I’ll call them arm rest inserts. Then I sewed piping to the edges of them. And sewed them to the chair. My bottom piece in the center was a little long so I had to trim it. 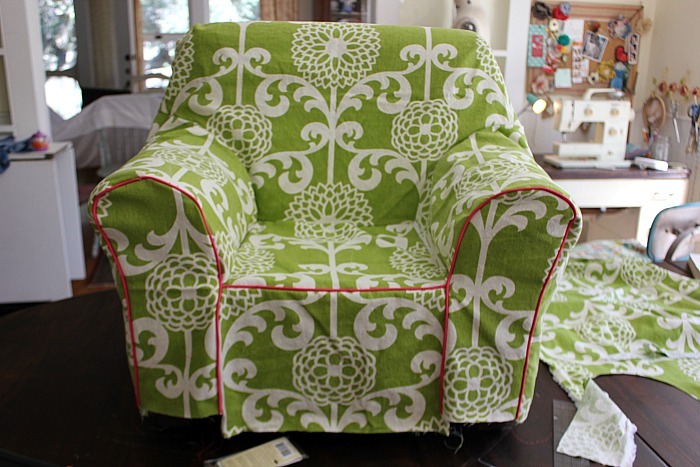 The next step was to draft the back piece and sew it to the chair cover. I made the center a little wider as you can see so it would fit over the bulging armrests. I could have also sewn in a zipper along one edge to make it easy to put the slipcover on but it fit over the chair as is easy enough. The last part was the bottom ruffle that covers the legs of the chair. 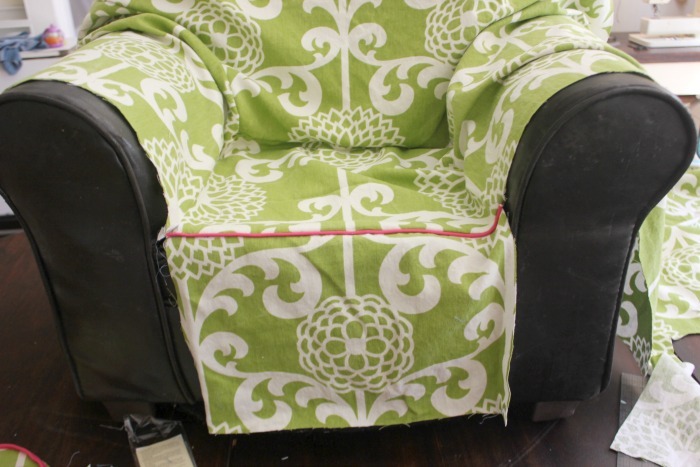 I hardly had ANY fabric left so I had to cut out lots of little strips and sewed them together to make a strip that was double the circumference of the bottom of the chair. 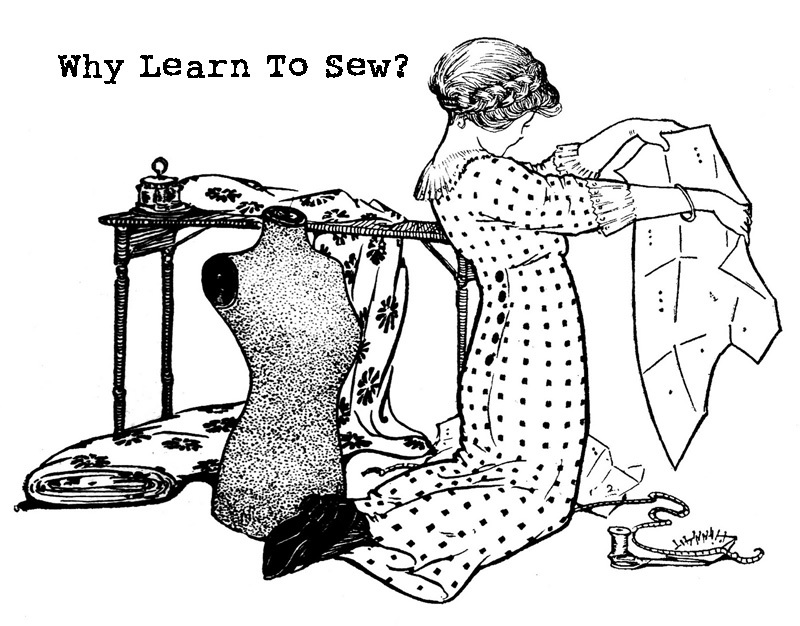 I have a habit of just sewing something without measuring how much fabric I will need. BUT my eye is practiced, and I have only come up short on one project so far recently, when I didn’t have enough fabric for a sleeve. 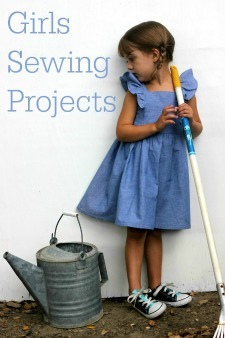 So unless you have a lot of experience sewing, you should always make sure you have enough fabric to finish a project before you start it. I hemmed the long ruffle strip, and pinned in the pleats just eyeballing them, them sewed them down. The whole project took about three hours. 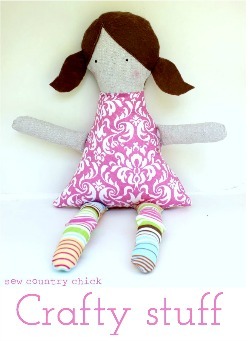 This is a project an intermediate sewist can do in a day. 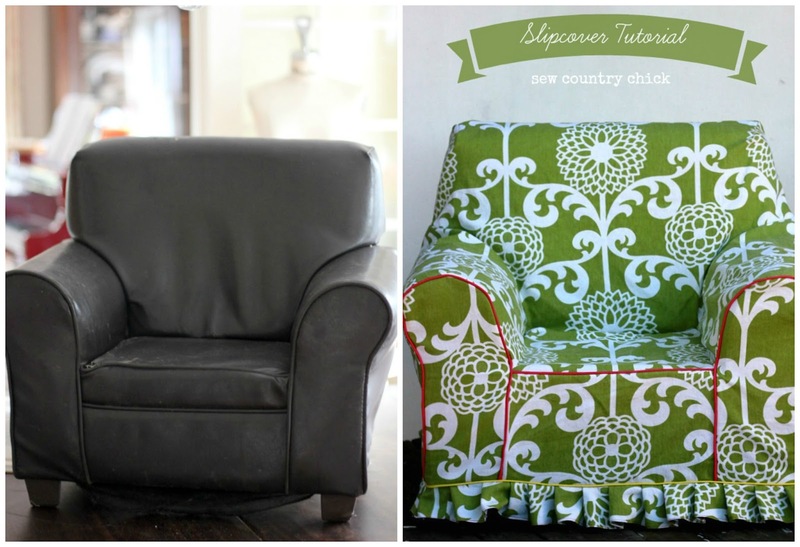 You will love making slipcovers ! I love it. And you make it look simple but I know that it is a huge job. It was worth every second though because now it looks magnificent. Bravo! 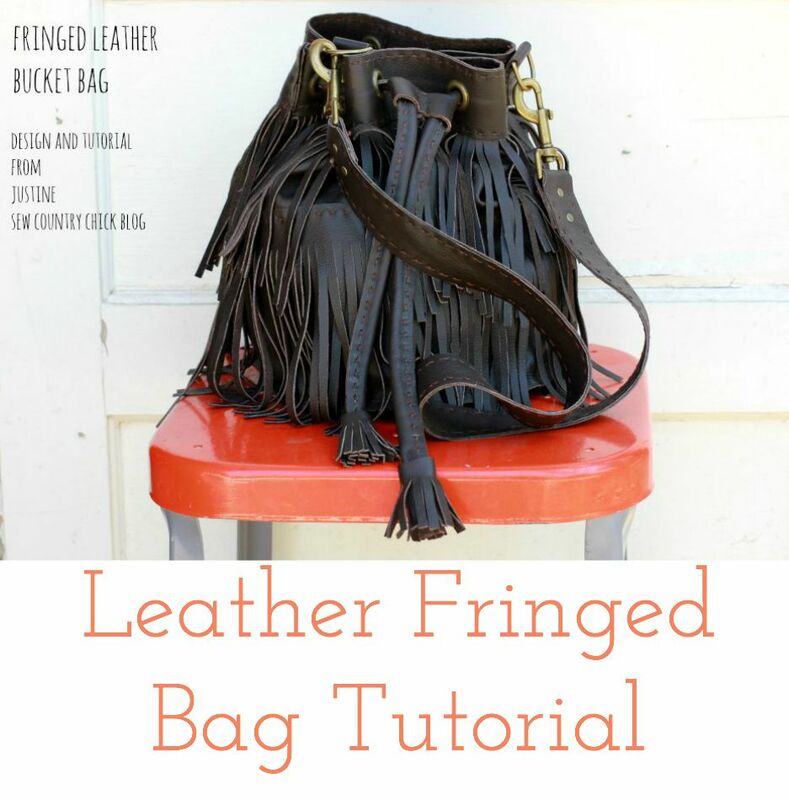 Great tutorial and very nice slipcover! 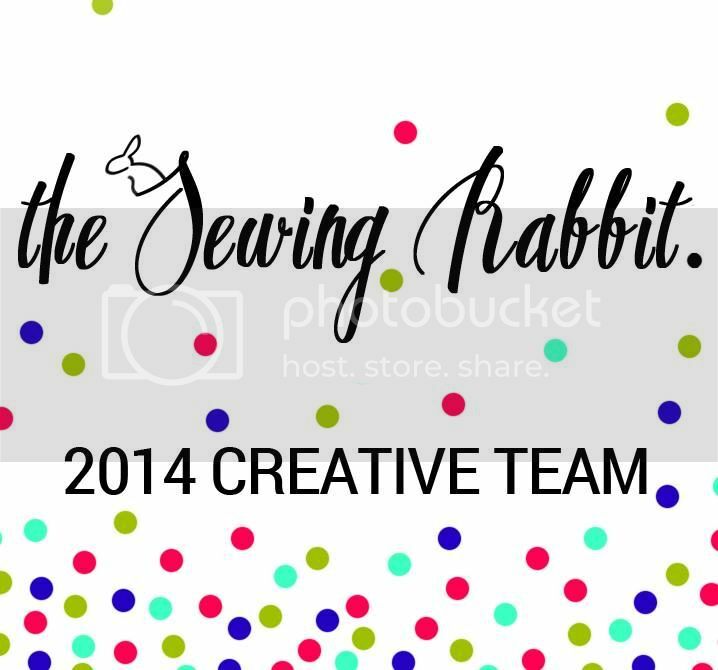 Thank you for sharing the contest on Joann’s Facebook page and the tutorial. The chair is lovely. I’m fairly new to sewing and it is amazing how far 2 yards of fabric can go! 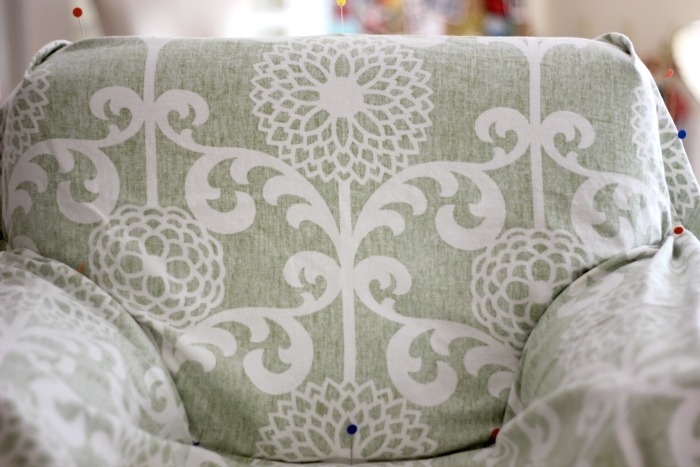 The chair is a beautiful use of the Waverly Fabric. Justine, this chair is gorgeous..So proud that Gigi went and got it out of the throw away shed..Yea!! Your tutorial was excellent. and I love the line of fabric. Now , Gigi has a beautiful chair.. I had that same chair when I was a child except mine was a bright blue! Justine, you are SO clever! 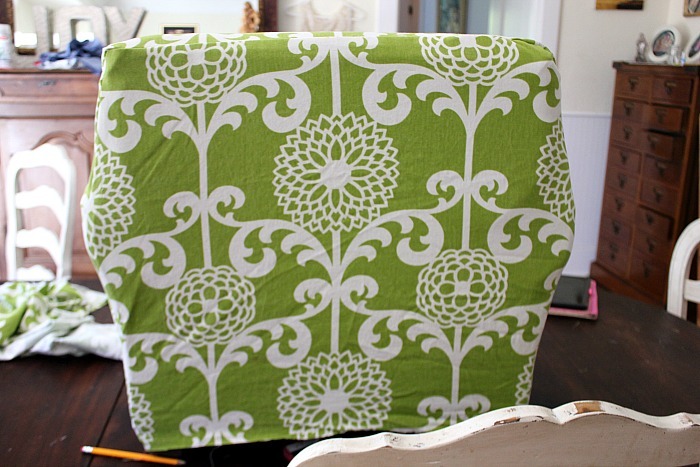 It blows my mind that you draped and calculated your way to such a pretty chair cover..wow! Wow, that’s so pretty! And your how-to makes it look totally doable. You did a fabulous job. Question? You said you unpinned your darts when you took the fabric off the chair and cut with a seam allowance. Did you re-pin the darts? Got a little confused there. Very good job! 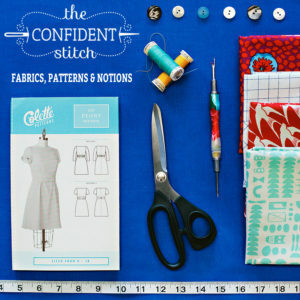 And fun fabric! I am putting off doing my couch. It is just an oversize chair basically. 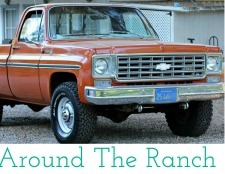 You have given me some inspiration to get closer to starting the project. Thanks so much! Mi sillón me pide a gritos que me tome todo este increíble trabajo . Wow! Turned out amazing, and the fabric is wonderful! I have a nice ole ugly chair in our bedroom, and it needs to be cleaned, (it wasn’t my chair, it was left at the house) it’s in very good condition, it’s just kind of yucky. So I decided that I wanted to recover it–maybe do a slipcover. Well, about a year ago we moved out of the country– we live in Mexico, and I’m still trying to learn my way around. 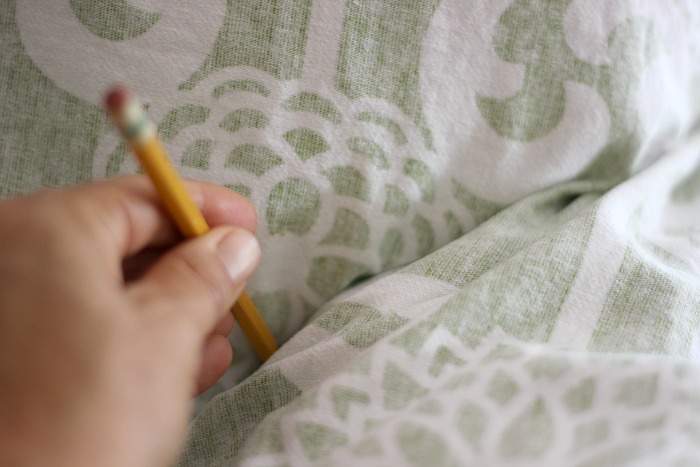 I’ve found a few fabric stores, but I am looking for some white canvas-like material. PLUS since I’ve only tried redoing a chair once, I wanted to sharpen my skills, so I started by looking around on your site, and VOILA! 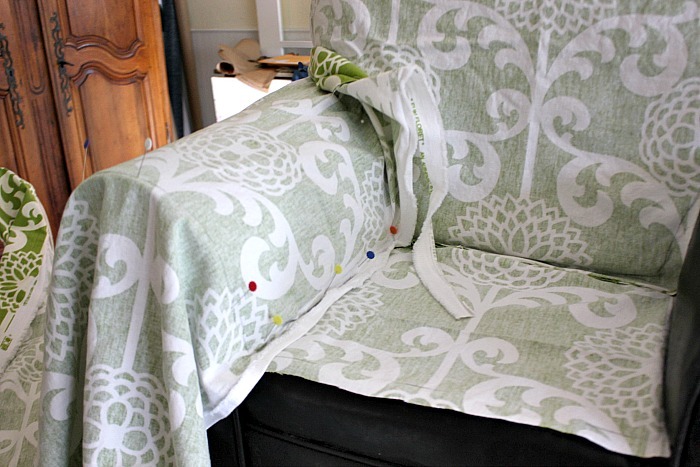 I found your tutorial for Waverizing your Arm Chair Slipcover. My arm chair isn’t as large, and I now feel confident that I CAN do this. So I want to say thank you for sharing your craft, I just hope my chair turns out as nice. Painters drop sheets are cost effective and come in wide widths. You make it look easy, Justine. Pinning for future reference. 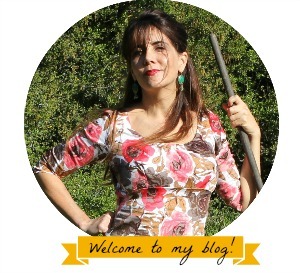 love it – I’m a beginning sewer with an office chair that needs the same sort of thing. Is this way too hard for a beginning sewer to do? I absolutely love your chair cover! Thank you for the great tutorial. I have a chair that need a slip cover and this will help me so much. Again thank you for sharing.